The 15-kg Olympic Bar is one of our flagship products. As a fundamental part of functional training, this weightlifting bar combines the best of the high-end bars with the simplicity and robustness of daily workout bars. 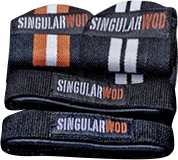 Important: Singular WOD recommends regular maintenance of your bar. For more information contact us at info@singularwod.com. Its use in conditions of extreme humidity or rain can produce premature deterioration that will void the warranty. If you are looking for a gentle rotation such as those given by weightlifting competition bars at a more attractive price, this is your bar. Made to last. Set of four stackable jerk boxes to find your perfect height during your weightlifting workouts. The Folding Rack gives you have all the advantages of our rack with built-in pull-up bar, including the ability to fold both sides of the rack against the wall, gaining a lot of space in a short time. An Axle bar as a basic item for Strongman training. After you try it, you'll want more. Includes a pair of Strongman Collars with lock. Designed so that simplicity, comfort, functionality and portability fit into the same product. It does not rust.